Why use a service like this? Very simply, for the sake of accuracy, and your peace of mind. A tattoo is a pretty permanent thing, and you want to ensure that it says what you want it to say. Using an automatic translation program will very rarely give an accurate translation. And despite the best of intentions, somebody that is in the process of learning Hebrew may not have a deep enough knowledge of the subtleties and nuances of the language to give you a truly accurate and fitting translation. Even some native Hebrew speakers may not have a high enough standard of the language to give a correct translation. After all, don’t we all know some native English speakers with a less than perfect standard of English? A quick internet search for images of Hebrew tattoos throws up many examples of misspelled tattoos, or tattoos where we can see what meaning was trying to be conveyed, but has not been done as well as it could have been. Check out the Bad Hebrew Tattoos blog for many examples of incorrect Hebrew tattoos and an explanation of how they were made. First and foremost, for the very personal service that we offer. 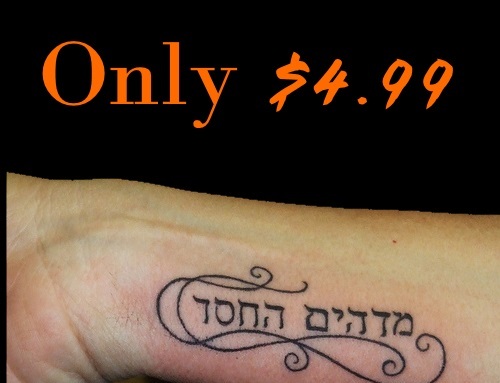 You will be discussing your exact requirements with a group native Hebrew speakers who will discuss and clarify exactly what it is that you want your tattoo to mean, so that it will say *exactly* what you want it to say. We will also discuss how well your chosen phrase translates into Hebrew, as some English phrases may not translate well at all. We will be happy to offer suggestions for the best way to convey the meaning that you desire, if we believe your chosen phrase translates poorly into Hebrew. We have the most competitive prices that we have so far been able to find on the web (see our 'Services' section), and in our opinion you get much more for the price you pay. Please note: Our initial consultations are free! We discuss your needs and options with you, and once we know how many Hebrew words your translation becomes, we quote you a price. At this point you can either make payment and instruct us to proceed with the work, or you can decide not to proceed, and walk away without paying a thing. How do we differ from other services? We offer a more personal service than any other we have encountered so far. We consult directly with you to clarify your exact requirements, before any payment is required. On other sites, you are just required to type in the words you want translating and pay immediately. Our method leaves no room for error, and our helpful suggestions have been much appreciated by our customers, and often taken up. We can provide you with dozens of font and style options, not just one or two. Why have a Hebrew tattoo in the same font as everybody else? Our many options mean that you can choose a style that you feel suits you best. We have over 65 for you to choose from. We will supply your chosen word / phrase in ‘outline’ lettering (which your tattooist may require) and if requested, will also include vertical directions, make your text run in a circle or an arch, and all of this at no extra cost – other websites charge extra for this. Follow up service. Once we have sent you your final translations, we are happy for you to come back to us for further help and advice, for example, should you require your chosen phrase sending again in a different size. Our service does not stop once we have been paid and you have received the work we have done for you.